Obama said that this partnership could chart the course for a better future at a time when democracy itself was being questioned. NEW DELHI: While hailing Prime Minister Narendra Modi for his role in the Paris climate accord, former US President Barack Obama on Friday said that there is no problem that cannot be solved if India and the US work together. "If India and the United States are working together, I believe there is no problem we cannot solve," Obama said while addressing the Hindustan Times Leadership Summit here. Stating that both countries have much in common, he said: "That's why I have always believed there is something more than the strength of the US-India alliance. I believe the partnership between the world's oldest democracy and the world's largest democracy is a defining partnership of the 21st century." He said that this partnership could chart the course for a better future at a time when democracy itself was being questioned. 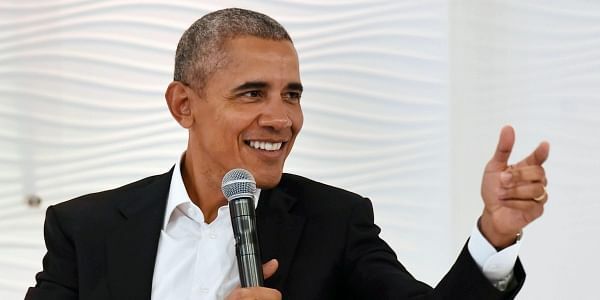 "Globalisation, technical advances, terrorism, rising inequality, rapidly transforming climate, these have not only shaken the foundation of individual families but also our collective politics and our common institutions," Obama stated. He said that though the world today was less violent than most of human history, it was still being driven by old divisions, new conflicts and slaughter of innocent people. He said that in these times of uncertainty, countries should shed the politics of "us versus them" and should instead embrace the commonalities that they share. "Just look at how our two countries have succeeded having thrown off the yoke of colonialism, we crafted Constitutions that begin with the same three words - we the people," Obama, the first US President to visit India twice while in office, said. He said that the history together of India and the US speak through a common set of values - values of pluralism and tolerance, openness and rule of law, a liberal market-based economy that places the primacy of people's individual rights, including the freedom of speech and freedom of the press. "We have to promote these values everyday because there is a competing narrative. These values are often under attack and if we are not constantly reinforcing them and passing them on to the next generation, they can wither away," he said. Obama said that he and Modi met an unprecedented nine times because all the key challenges in the world would be easier to achieve if India continued to play a larger role not only in the Asia-Pacific region but on the world stage. "Just as we have to work to continue to alleviate inequality in our own countries, we still need to do more work to close the gap between rich and poor nations and making sure that fragile states don't collapse, making sure that countries where young people have no hope finally get some hope, " he said, while listing out some suggestions. "That's not just the right thing to do, the charitable thing to do, it is in our self interest, it is the smart thing to do for long-term stability." "As powerful as the United States or India is, it cannot solve any of these problems alone," Obama said. "I was very appreciative of the critical role that India played and Prime Minister Modi played in forging the Paris accord to fight climate change. That was not an easy thing to do politically but it was the right thing to do." Referring to US President Donald Trump pulling his country out of the Paris accord, he said that though "there has been a pause in the American leadership", the good news was that states, companies, universities and cities in the US were continuing to work to ensure that the country lived up to the obligations that it had made to the agreement. "Third, I would point out that diplomacy still matters and that although we have not seen great power contests as we saw in the 20th century , with rogue states like North Korea and their missile launches, with disinfection in places like the Middle East where terrorism is still a constant threat, we can't just rely on our military and our weaponry to solve those problems," Obama stated. He said that he deeply believed "in the liberal international order that together we have forged" that was not based on military power or national affiliation, but was based on principles, rule of law, human rights and individual freedoms.